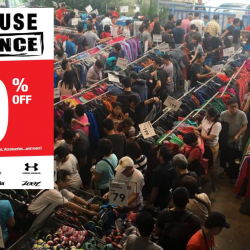 Home-Fix Warehouse Sale 2017. The highly anticipated event will be happening from 28th - 31st December 2017, 10am to 8pm at 19 Tai Seng Avenue. You definitely don't want to miss this event! Share this with your friends & loved ones on Facebook now... 'cos everything MUST GO! Previous: [OLDTOWN White Coffee Singapore] Save the date and drop by for our Jurong Point Opening celebrations. 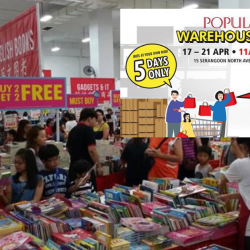 17 - 21 Apr 2019 POPULAR: Warehouse Sale with Up to 90% OFF on Stationery, Assessment Books, Music and Gadgets & IT Products! 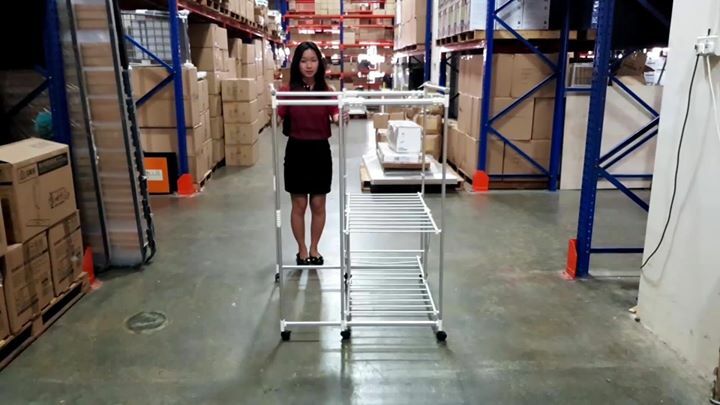 POPULAR Warehouse Sale is happening from 17 to 21 April 2019! SAVE up to 90% on Stationery, Assessment Books, Music and Gadgets & IT products! Check out their Purchase With Purchase deals with savings of up to 50%. Also receive $25 worth of vouchers with min. $100 nett spend. First 1600 Citi credit cardmembers get additional $5 cash voucher! See you there! Valiram Friends & Family Sale is back with incredible deals up to 70% off! Starting on Friday April 19, at Chengal Ballroom, Crowne Plaza Hotel Changi Airport, Terminal 3, Singapore. Gather your friends and family for three days of great deals on your favourite luxury and lifestyle brands under the Group. Participating brands include Michael Kors, Steve Madden, TUMI, Giuseppe Zanotti, Bath & Body Works, Victoria’s Secret, Swiss Watch Gallery and more. Exclusive for all UOB card members: enjoy an additional 5% off any purchase. It's Easter week and you do not want to miss these $0 + airport tax fares at Jetstar! 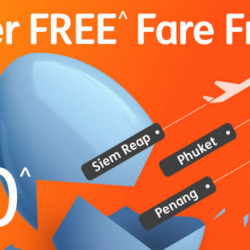 Book your flights to Penang, Darwin, Haikou, Phuket, Bali and more by 20 April 2019. S$0 fares are one way, excluding airport taxes and fees. Promotional fares are not available for all flights. Check individual links for applicable travel periods. 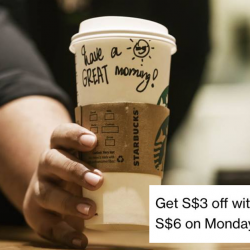 Till 28 Oct 2019 Starbucks: Get S$3 OFF with Min. Spend of S$6 on Mondays with Standard Chartered Cards! Chase away Monday blues with this offer at Starbucks! From now till 28 October 2019, get $3 off with a min. spend of $6 on Mondays at participating Starbucks stores when you pay with a Standard Chartered credit card! Limited to the first 50,000 redemptions. Liv Activ Warehouse Sale is back with up to 70% off selected outdoor performance, sports & lifestyle apparel, footwear, and accessories! Happening from 25 to 27 April 2019, take your pick from brands such as The North Face, Gregory, Under Armour, Asics, Helly Hansen, On, Zoot & Patagonia! 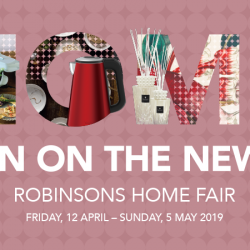 12 Apr - 5 May 2019 Robinsons: Home Fair with Up to 60% OFF Regular Priced Items & Additional 20% OFF for OCBC Robinsons Group Visa Cardmembers! From Friday, 12 April – Sunday, 5 May 2019, discover everything new and exciting that’s designed to turn your house into a home of great beauty, style and comfort at the Robinsons Home Fair. Enjoy up to 60% off regular priced items and additional 20% off for OCBC Robinsons Group Visa Cardmembers. Exclusions, T&Cs apply. Check in-store for more details. While stocks last. 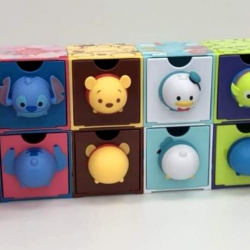 17 Apr - 25 Jun 2019 7-Eleven: Collect Exclusive Tsum Tsum Stack ‘Em Drawers When You Spend at 7-Eleven! Introducing the exclusive Tsum Tsum Stack 'Em Drawers now available at 7-Eleven outlets in Singapore! Simply spend $4 in stores to get 1 stamp and collect 20 stamps to redeem one drawer! Or if you can't wait to bring these cuties home, just collect 6 stamps and top up $5.90. 6 adorable Disney characters and 12 irresistible designs to be collected, so hurry to your nearest 7-Eleven today! 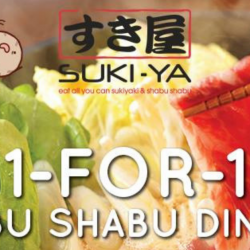 15 - 21 Apr 2019 Suki-Ya: Enjoy 1-for-1 Shabu Shabu Dinner at Tampines Mall! If you missed the 1-for-1 Shabu Shabu lunch offer at Suki-Ya Tampines Mall, don't worry, here's a better offer - 1-for-1 Shabu Shabu dinner! Yes you read that right, DINNER! For one week only, indulge in your favourite All You Can Eat Shabu Shabu with 1-FOR-1 DINNER at Tampines Mall! Don’t miss it from 15 - 21 April 2019, 4pm - 9.30pm! See you there! T&Cs apply. 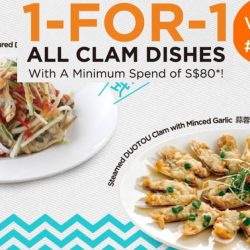 Till 30 Apr 2019 Putien: Enjoy 1-for-1 All Clam Dishes at VivoCity in April! PUTIEN Vivocity has reopened after a month of renovation. Don't miss out on this exclusive opening promotion from now till 30th April! Enjoy these luscious clams from DUOTOU at Putien with their 1-for-1 on all clam dishes offer! Valid with min. spend of $80. 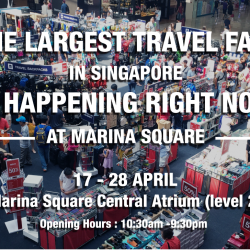 Singapore's Largest Travel Fair by The Planet Traveller is happening from 17-28 Apr at Marina Square Central Atrium. Enjoy up to 80% off travel gear, luggage, backpacks & travel accessories. Special buys at great discounts from well-renowned brands, including Eagle Creek, Klean Kanteen, Moleskine, Nalgene, Osprey, Pacsafe, Thule, Victorinox and many more. Citi Cardmembers enjoy an additional 10% off with $120 spend. 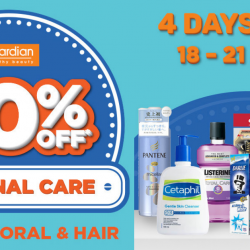 Show some love for yourselves and indulge in Guardian's amazing deals! Get 30% OFF ALL PERSONAL CARE items from now till 21 April. What's more check in everyday for the DAILY DEAL offers! Shop at all stores and online now! *Terms & conditions apply. Whilst stocks last. 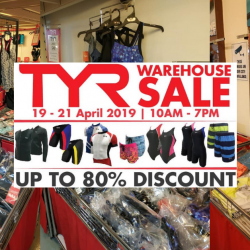 TYR Warehouse Sale 2019 is here! From 19th to 21st April 2019, get up to 80% Discount on merchandise ranging from Shoes, Sunglasses, Dragon Boat Equipment, Active Wear, Goggles, Accessories, Backpacks, Swimwear, Apparel, Swim Caps, Cycling & Triathlon Apparel & many more other items! Check out the bundle deals at the sale! Free Gifts with Purchase too! 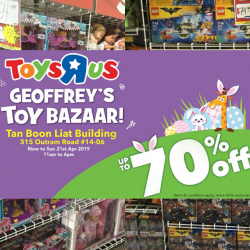 Geoffrey's Toy Bazaar is back! Up to 70% off selected brands including LEGO, Gundam, Star Wars and more! Only open this weekend from Wed 17th Apr to Sun 21st Apr 2019 from 11am to 6pm. Don't miss it! [Jetstar]  An egg-citing sale is starting soon… Are you ready? [Qoo10] It’s Here for 1 Day! Ultimate Masks Sale – NEW Laneige Cica Sleeping Mask for Skin Recovery! Shop Origins, Lululun, SNP & More! [Gilt] The Men’s Day Memo: Ermenegildo Zegna to Canali. Jared Lang. And more.